This is my 1000th Black Mark blog post. That means approximately 4,000,000 words and 1,400 photographs. There has had 495,000+ views from 155 countries around the world (still no views from Greenland, Cuba, Iran, South Sudan and various central African countries, you get the idea). I started this blog in on February 16 in 2008. My first Black Mark blog post was about the painting of the wall of Faster Pussycat and actually includes a video of several notable Melbourne street artists, including Phibs and Deb painting a wall in Fitzroy. When I started writing this blog it gave me a new reasons and motivation to look at art and Melbourne. I started to look around in a new way. James Gleeson suggested that the role of the art critic is that of an explorer, leading others to new and interesting discoveries. Every week I try to see several exhibitions, walk the streets of Melbourne, as well as spending time reading and researching. I would like to see more art exhibitions but I can’t be everywhere; there is so much to see and Melbourne’s vast geographic sprawl does not make it easy for me. Between the art galleries I am looking for graffiti, street art, ghost signs, urban design and public art. Other things that have caught my interest from the design of micro-parks to drinking fountains. It was not just ‘paintspotting’, craning my neck to look down every lane that I passed in I case I spotted some graffiti or a ghost signs. Writing the blog gave me a reason to think more and follow up with further investigations into what I had seen. That research has lead me in many directions, a good hobby should do that, expand your interests rather than narrow them. 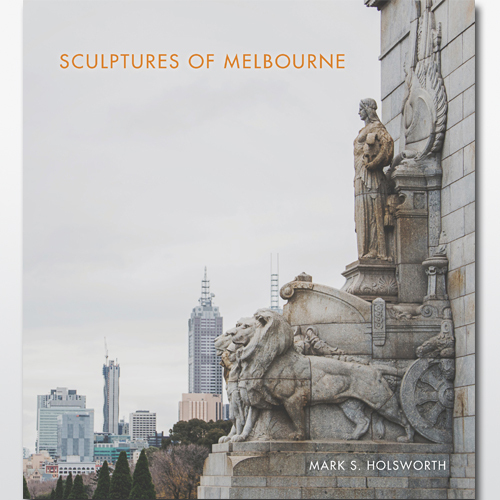 Last year my first book was published, Sculptures of Melbourne (Melbourne Books, 2015). My interest in public sculpture grew from writing blog posts about various sculptures. I couldn’t have imagined that I would write a book about public art before starting my blog. Looking at my top ten posts you can tell that the public is interested in the subject. Where is the political art? Slightly further down the list there is a cluster of three posts that I am particularly proud to have written. In Political Motivation Behind Police Raid I discovered important background to a major story about attempts to censor art and end public funding for Linden Contemporary Arts. More Art Censorship is unfortunately about a similar story; my initial response to Kevin Rudd’s attempt to censor Bill Henson. I feel I got that exactly right. And my post about the relationship between Street Art, the Internet & Digital Cameras where I’m pleased to have used a chemical metaphor to explain their relationship. I will be celebrating my 1000th blog post with a psychogeographical walk this Sunday. This is not a tour, but a classic psychogeographical walk, there is no plan and no destination. According to Facebook 20 people say that they will be joining me on this walk, I feel honoured, nervous, imposter syndrome, looking forward to seeing you and curious about what will happen. Thanks everyone for reading, subscribing and commenting. Everyone has their own theory about the methods and purposes of psychogeography, is it magic or unknown science, but the one thing that people are sure about is that it involves walking. 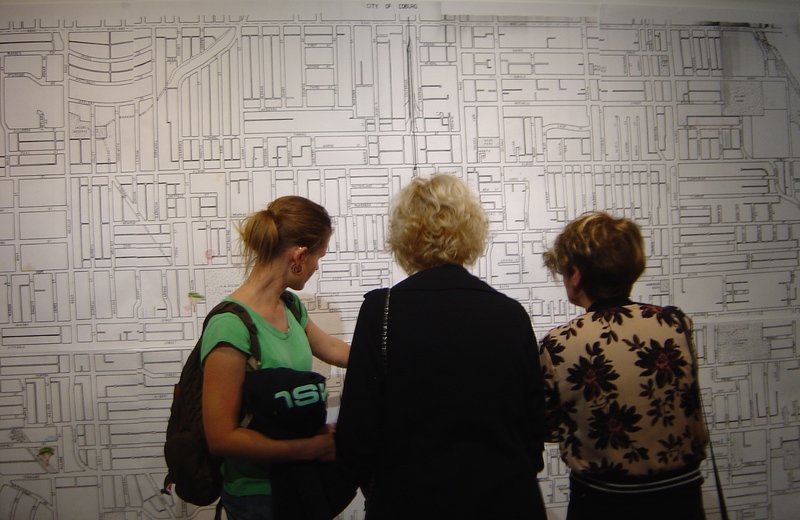 Psychogeography may be a form of literary or artistic fiction about a crowd-sourced index and map of various cities. It is not intended for the sole-benefit of the researcher, although it may well be, but for a larger audience. In this it can be distinguished from religious or spiritual walks; pilgrimages, walking meditations or the Aboriginal walkabout as these are done for the spiritual benefit to the walker. There are different types of psychogeography. There is the psychogeography of the Situationalists; the dérive, and all that programatic pseudo-scientific shambolic stuff at the start. Not forgetting all the other wanders of the city that had come before them, especially in those Paris streets. The psychogeography of Stewart Homes (London Psychogeographical Association and the Manchester Area Psychogeographic) where the Situationalists philosophy is mixed with the magical geomancy of lay lines and architectural conspiracy theories. My own version of psychogeography are predicated on research and strays into both the territory of local historians and even archeologists. When I asked my friend Geoff Irvin, a real, professional archeologist about describing my activities as “a surface archeological survey” was an abuse of term, he scoffed at the much abused idea of surface archeology and told me to abuse away. My predilection for amateur local history comes from mother’s side of the family; my mother’s main interests are Chinese immigration to Australia and graveyards in Central Victoria. My maternal grandfather, Harold S. Williams wrote a series of history articles, “Shades of the Past” for the Mainichi newspaper during the years 1953 to 1957 along with a couple of books. He was a bit of flâneur, reporting on the local history, observing the coffee shops and other minutia of life in Osaka, sometimes with a revolver in his pocket. So I suppose that I’m carrying on a family tradition. I have now been writing this blog for six years. Travelling around Melbourne: walking riding my bicycle, taking trains and trams. I am not a pedestrian purist, like Will Self, for me psychogeography can be conducted by other forms of transport, although for accurate observations being on foot (or on a bicycle because it is easy to stop and start) is best. Perhaps we need another term, other than crazy ‘psychogeography’, or perhaps the activity has already divided in specialist areas of interest: ghost signs, paint spotting (looking for graffiti), legend tripping and urban exploration. The psychogeography of Sydney Road part 2; continuing my tram stop survey from my survey of the Brunswick end of Sydney Road in part 1. Moreland Road the division marks the division between Brunswick and Coburg. 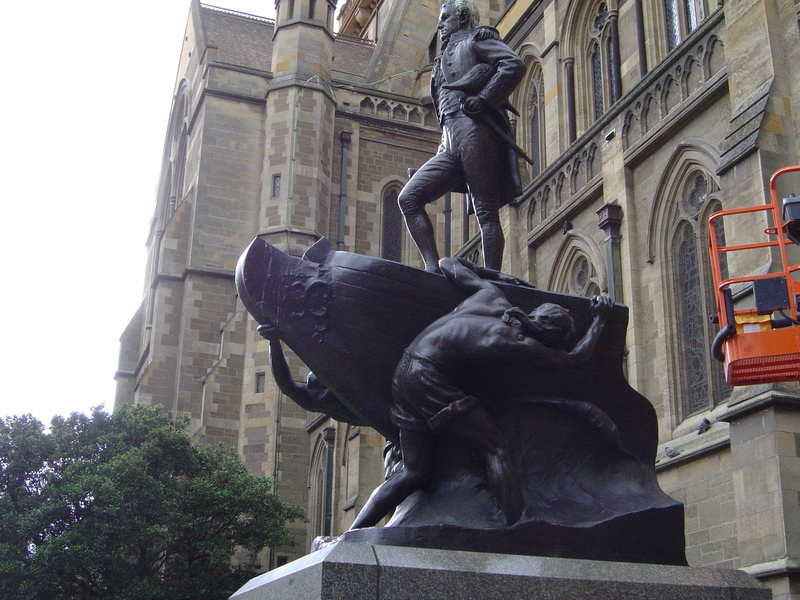 Coburg was once the breadbasket of colonial Melbourne with its rich fertile volcanic soil. Originally called Pentridge Coburg changed its name to disassociate itself from the prison that was its major landmark. To the west on Moreland Road is Moreland Station. The micro suburb of Moreland is no longer much of a feature. 29. Mores Street, there is a vacant patch in this area. The old “Hygienic Diary” is a reminder of Coburg’s past and the 7/11 the contemporary. 30. The Avenue, Kangan Institute’s Coburg Campus. The posh area of Coburg is in the roads off to the east. The division between the wealthy eastern side and poorer western side is typical of social organisation in Melbourne by compass directions. Woodlands Hotel that used to have its own horse racing track out the back. 31. Reynard Street corner with the Post Office Hotel, the hotel is a lot older than its art deco facade. On the east side of the road there are is a new office block with an ALP Senator’s office. On the western side there is an Indian grocery, framers, Italian tailors making handmade suits and fish and chip shop. 32. 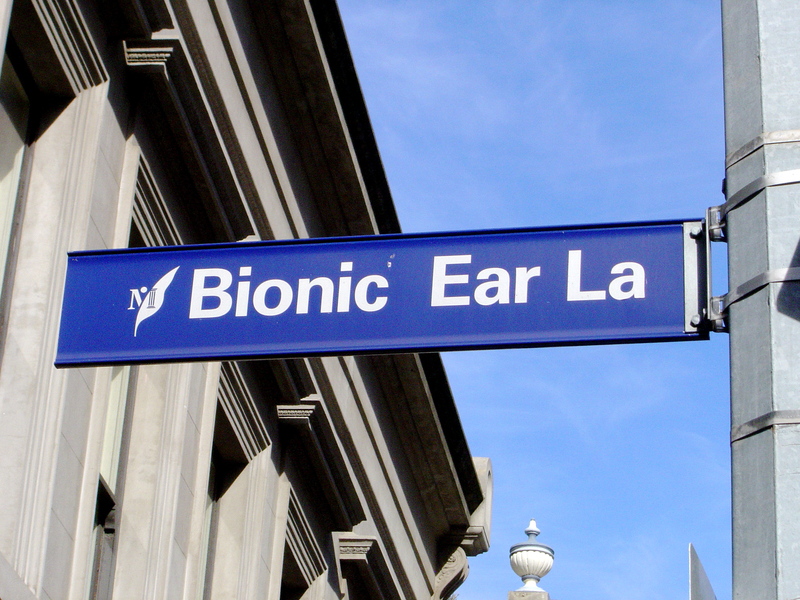 With Harding Street going east and Munro Street going west. This is the start of the main Coburg shopping, transport and local government hub. The corner also sums up the whole of the Sydney Road shopping experience with bridal, Indian clothing stores, Islamic fashion and a few good places to eat. 33. 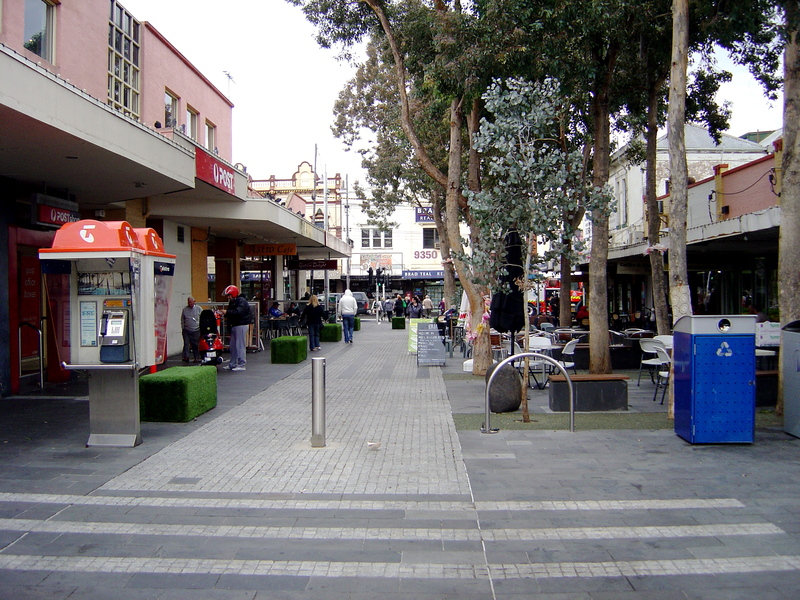 Victoria Street mall and the Coburg Market. Coburg Station is through the mall and across multiple car parks. The facades in the shopping strip date from the 1960s and the modern style is now looking old fashioned. The very thin silk fabric shop that has been there forever is closing down. Lots of banks, take-away food and discount shops. 34. 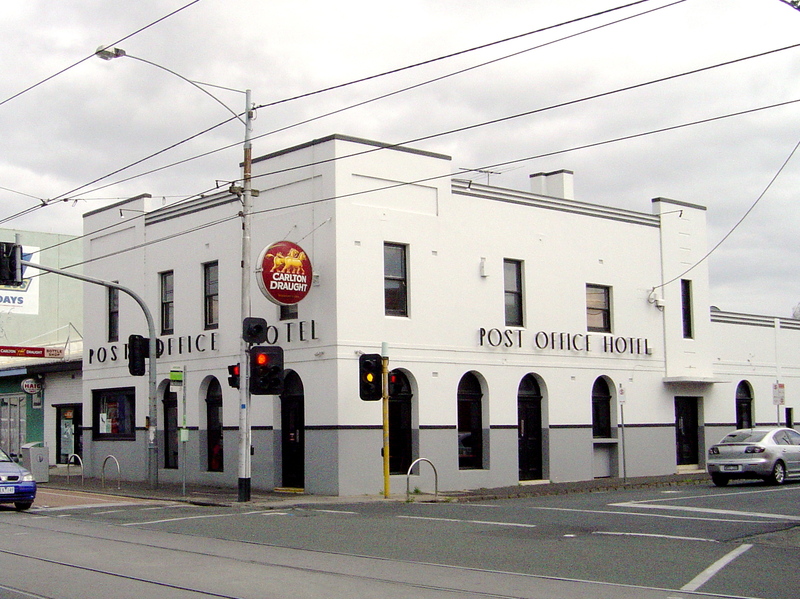 Bell Street is the division between Coburg and Coburg North, another psychogeographical division in the rings around inner Melbourne. Bell Street is now a transport hub with bus stops and an entrance to the Coburg train station. On the opposite corner is a park with the Federation bicentenary pond in front of the church. Following the park there is line of churches next to the prison; it is a remanent of local council compromises with the multi-sectarian population that could not sustain all of them. This area creates a psychic barrier for the North of Coburg’s shopping centre. There is schizophrenic relationship between sides of the road; the western side looks like a slum with demolition work, whereas the eastern side looks more like Parkville, however over the following tram stops this process alternates back and forth. There is a lot of guerrilla gardening on the side streets to the west, the bike path is lined with flower gardens. 35. Champ Street is a city only stop; the entrance of Pentridge Prison is down Champ Street. (See my post on the rehabilitation of Pentridge Prison). On the eastern side is the historic heart of Coburg whereas the western side now looks like a typical main road in a light industrial suburb. 36. Rogers Street and the Drum Hotel; after this suburban houses start to appear along Sydney Road. 37. 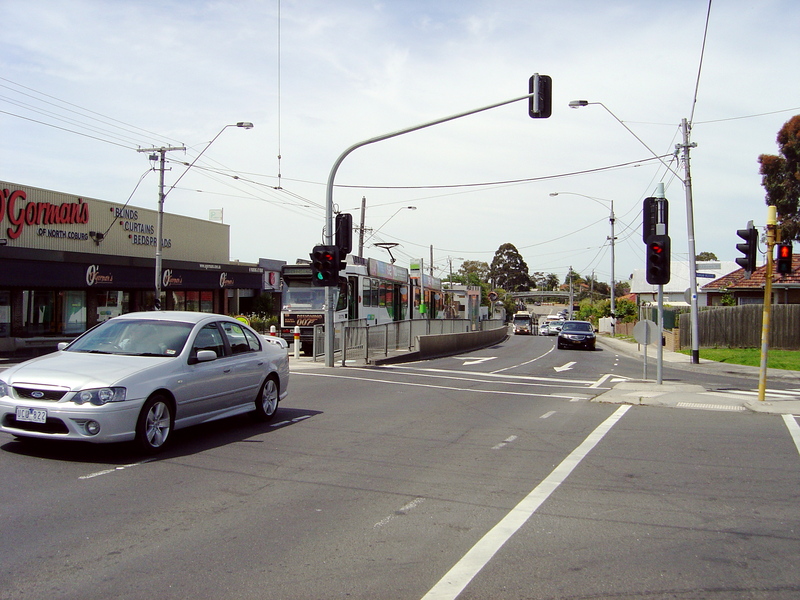 Gaffney Street; to the west is Batman Station and to the east the Coburg Lake Reserve. On the east side are shops selling blinds, catering equipment and on the west side there is an empty lot with flashing signs, tyre shop and the old Coburg Fire Station that now sells auto parts. 38. Carr Street and Renown Street; on the east side is Lake Park Kindergarten, Budget Motel and Car rental and on there are west side substantial two story brick houses. 39. Mercy College on the east side and the brick houses continue on the west side. Next there is pedestrian overpass followed by a the logical arrangement of funeral services next to an aged care home. 40. The tram terminus stop at Bakers Road where the tramline ends with a new centre road stop. On the east side is a business selling blinds and the Salvation Army Divisional HQ. On the west side there is a vacant lot being turned into a garden, a bench has been installed and trees planted. The houses beside the road are now weatherboard. North of this the road continues with a motel and other auto related businesses, a clear indication that you are now entering car territory.